Whether you’re headed out to hunt down squirrels or soda cans, this case of 5000 .22 Long Rifle cartridges from Winchester guarantees you’ll have enough ammunition to finish the job. 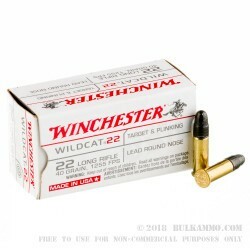 Every Winchester Wildcat cartridge in this case carries a 40 grain Lead Round Nose (LRN) bullet in a brass rimfire case. 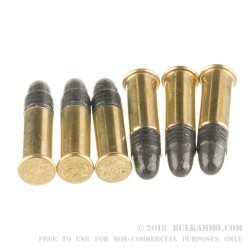 The lead bullets are lubricated for reduced fouling and reliable travel down the barrel, so whether you’re hunting or plinking you know you can trust the round in your chamber. 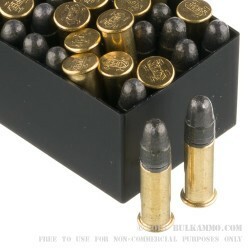 Introduced in 1887, the .22 LR cartridge is the most common round in the world. There is a vast array of firearms chambered in .22 Long Rifle, ranging from revolvers to semi-automatic rifles. 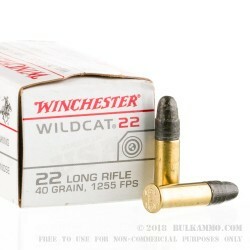 Its low recoil and low cost make it a popular choice for recreational shooting and training new shooters; it’s also effective at varmint and small game hunting. Be warned that once you start shooting, it's hard to stop; make sure you buy enough!